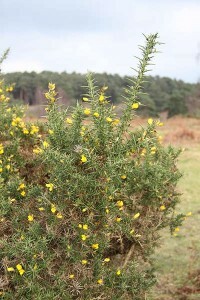 Gorse grows in many parts of the Forest, in thick clumps the animals use as shelter. Even though its leaves are spiny, the animals still eat it, especially in winter. It’s also known as furze (pronounced fuzz). Some commoners remember collecting the furze, and chopping it in a chaff cutter with mangles to make a feed for their animals. When gorse gets old, it becomes spindly, so it’s burned or cut- down to re-grow thick and bushy again. The New Forest gorse is home to lizards and other wildlife, including a very rare bird called the Dartford Warbler. That’s one reason why there are strict rules about how and when the gorse is burned. Gardens and animals don’t mix. Gardens by the open Forest need to be securely fenced, or animals might break in and cause all sorts of trouble. One pony had to be rescued by the fire brigade after walking onto the green plastic cover of a swimming pool, probably thinking it was grass. Some garden plants are poisonous to animals, so people need to be careful about what they plant close to the Forest, as hungry animals will try nibbling anything that grows near a fence. Garden waste should never be dumped on the Forest, as it can be poisonous. Grass clippings are particularly dangerous for ponies and can kill them.